TMNT (2007) on the Xbox 360 was a pretty good game that unfortunately was just a little too linear and easy for those who grew up on the at times brutal beat-em-ups developed by Konami in the 90’s. 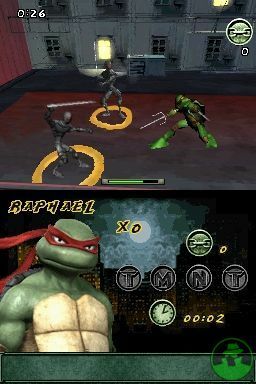 Compared to the DS game of the same name which tries a similar structure though a little big differently, the console version of TMNT (2007) might as well be one of the older MegaMan games from the NES. Those who liked the game of the same name on console, like myself, hoping to have a similar experience on the DS should prepare to be very disappointed. 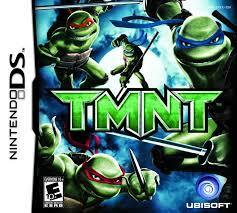 TMNT (2007) for the DS is a short, forgettable and above all else easy game that will let down fans of the franchise. There’s not a lot to say about the story in TMNT (2007) that I didn’t talk about in the review of the game of the same name on Xbox 360. The only real difference is that unlike the console game which has the brothers recounting the events to Splinter, it’s just a straight up interpretation of the movie. It’s easy to follow, like the movie, and told via stills captured from the movie with some text. 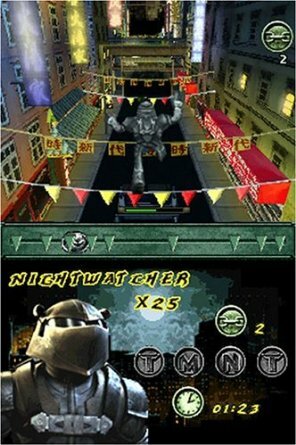 As opposed to making a Konami-esque beat-em-up for their first Teenage Mutant Ninja Turtles effort, Ubisoft instead opted to make a game that was part Turtles, part Prince of Persia that fitted together pretty well. The DS game takes a similar approach that is both insultingly simple and at the same time needless complicated. In TMNT (2007) you have three, count them THREE buttons that do the exact same thing. Hitting A makes your character jump to the right, X will make them jump forward, and Y, you guessed it, makes your character jump to the left. Each level has you running to a spark, then hitting whatever button will bring your character to the next spark. Sometimes to break things up a little you’ll have to charge the B button when sliding down a ramp, holding on to a ledge, or swinging on a rope to gather momentum to move you forward, but for every level of the game this is what you’ll be doing. Like the console game it’s pretty cool to see the Turtles performing parkour moves but the inputs and controls feel far too automatic to be engaging. Other than the instances where you have to charge a button for an added jump, you’re given a lot of time to make your next move. Completionist can choose to seek out T-M-N-T letters hidden in every level or compete to get a better time, but it’s hard enough slogging through the levels of this game once, let alone going back and doing any of them over again. When not performing run-of-the-mill platforming, you’ll take part in combat that is somehow even less engaging than the console game. I’ll give this game points in that you can’t hold down a button and release to win, but you’re still just mashing a single button to win uninteresting fights against foot soldiers and other goons. Navigating the small, boxed in arenas is also pretty awkward even with the analog nub of the 3DS which I played this on. It’s often hard to line up directly with who you’re trying to fight and then even harder to hit them. Bosses require a little bit more strategy, as you sometimes have to hit a button to perform a dodge roll, but otherwise they’re all pretty easy and you can still just mash attack to win pretty easily. I played this game with headphones and though none of the music was annoying, I couldn’t probably hum any of the songs to you at the same time. The graphics in the environments are serviceable for the handheld, but not so much when it comes to the characters. Before each fight for example, the camera does a close up of whatever character you’re playing as and not only do they not resemble the art style of the movie, they’re barely recognizable as a Ninja Turtle with their box-like heads and weirdly angular bodies.